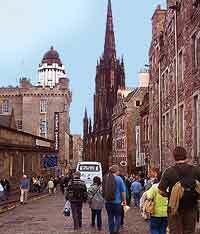 Edinburgh is a shopper's paradise and has many hundreds of independently owned stores selling unusual goods. 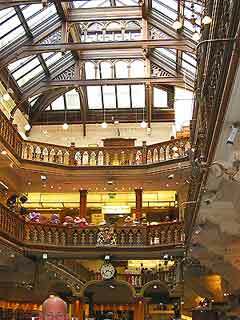 There are a number of specialist shops in Edinburgh, including jewellers, art galleries, craft shops, toy shops, antiques shops, gift shops and there are also countless clothes shops in Edinburgh, providing the perfect place for some serious fashion shopping. Edinburgh really does offer a world-class shopping experience and Princes Street is one of the main shopping areas in Edinburgh's city centre, with a large concentration of well-known chain stores, smaller shops and bargain outlets. Princes Street also offers spectacular views to Edinburgh Castle, across the gardens. There are a large amount of small, specialist shops concentrated in areas such as Thistle Street Lane in the New Town area of Edinburgh, Victoria Street, Cockburn Street, St. Mary's Street in the Old Town area of Edinburgh. Antiques shops are clustered in West Bow and Grassmarket in the Old Town area of Edinburgh, in the West Port and along the Causeway in southern Edinburgh, and along Dundas Street in the New Town area of Edinburgh. Most shops in Edinburgh open seven days a week, throughout the year, opening around 09:00 until 18:00 or later, particularly on Thursdays. 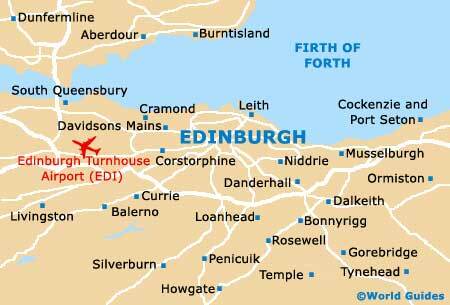 On Sunday, Edinburgh shopping opening hours are generally shorter than the rest of the week. Edinburgh's Cameron Toll Shopping Centre is situated about 15 minutes from the south of Edinburgh city centre, by bus or car. This large shopping complex includes a large supermarket and more than 50 other high-street outlets selling a variety of gifts, household accessories, travel, fashion and beauty products. The Fort Kinnaird Retail Shopping Park is located one the south side of Edinburgh, close to the main A1 road, and is around 20 minutes from Edinburgh city centre, by bus or car. This exciting, enormous shopping development covers almost 120,000 square feet and boasts a superb location on the outskirts of Edinburgh. With many top fashion outlets and major high-street brands, including Marks and Spencer, Gap, H & M, Borders, New Look, Laura Ashley and Next, Edinburgh's Fort Kinnaird Retail Shopping Park also features a large number of cafés and restaurants. Edinburgh's Gyle Shopping Centre features chain stores such as Marks and Spencer, Boots and Sainsbury's, together will many smaller independent shops, including numerous fashion boutiques and outlets. This attractive Edinburgh shopping mall is a 20-minute journey by bus or car from Edinburgh city, on the main west road out of Edinburgh. Ocean Terminal Shopping Centre is located in the Leith area of Edinburgh and is part of the continuing transformation of Leith into a thriving commercial centre for shopping and business. There are a large number of shops, including Debenhams and BHS, together with cafés, restaurants, bars, a cinema and also the Royal Yacht Brittania visitor centre. Situated on the site on an old fruit and vegetable market, Edinburgh's Princes Shopping Mall is in the heart of Edinburgh's shopping centre, at the end end of Princes Street. This shopping centre has three spacious floors with outlets selling designer clothes, music, books, Scottish gifts and souvenirs, upmarket jewellery and toys. On the ground floor of Edinburgh's Princes Shopping Mall are numerous cafés and fastfood outlets. Edinburgh's St. James Shopping Centre is situated at the east end of Princes Street, between Old and New Towns and close to Waverley Station. 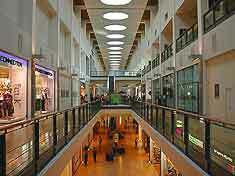 This large shopping centre has two entrances, one on Leith Street and one over the bridge from Calton Hill. At the heart of this large Edinburgh shopping mall is a popular branch of John Lewis, and dozens of other shops, including sports, fashion and gift shops. There is also a food hall upstairs, with snack food outlets and cafés.